Leaf finials for 1 inch metal poles. 6 7/8 inches long by 5 1/4 inches wide. Made of cast iron. Some colors are more than base price. Plain rings for curtain rod for 1 inch pole. 1 1/2 inch inside diameter by 2 inch outside diameter. Some colors are more than base price. Curtain rod bracket 3 inch projection for 1 inch metal pole. 3 inches high by 3 3/4 inches deep. Some colors are more than base price. 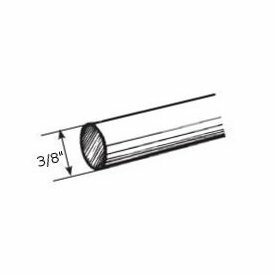 Projection --select-- 3 1/2" 4 1/2" 5 1/2" 6 1/2" 7 1/2"
6 foot twisted wood curtain rod 2 1/4 inch diameter. Decorative curtain rods for any window. Renaissance Collection by Design Elements. KS Klick System aluminum extrusion white powder coated finish lubricated for wall or ceiling mount. Note: Track only, slides and other accessories must be ordered separately. For light to medium weight draperies-residential and hospital cubicle, or hotel use. Must be shipped truck unless cut to 105" or less. Select Cut for Shipping at checkout if less than 105"
Projects 3 1/2 to 4 1/2 inches, clearance 2 1/2 to 3 1/2 inches. Rods are metal, finials are plastic. Installing curtain rods is easy! Brass finish, drapery hardware collection by Graber, a name you can trust. This set includes wall mount brackets and finials. Beme drapery rods or wide curtain rods. 9-330-1: Hold-tite stirrups projects 1 7/8" to 2 7/8"
9-332-1: Hold-tite stirrups projects 2 3/4" to 4 1/4"
2 inch Kirsch designer metal traverse rods comes in nine new colors. Custom sizes to fit windows up to sixteen feet wide. Each set includes plugs for finial and brackets for mounting. Three ring slides per foot included. Five optional finial selections available to complete your decor. Note: Truck shipping is necessary on rods ober 105 inches in width. Call for pricing. Inches --select-- 0" 1" 2" 3" 4" 5" 6" 7' 8" 9" 10" 11"
White finished metal sash rod for french door curtains. Use one on top and bottom to secure the curtain to the surface of the door while opening and closing.3/8 inch front to back, 1/2 inch projection and 3/4 inch height. Extends 28 to 48 inches in width, lockseam metal construction. Made of vinyl coated fiberglass yarns. 10 percent openness factor makes this roman shade fabric perfect for windows that require more privacy. Comes in 63 and 98 inch wide fabric. Available in cut yardage or 30 yard bolts. 1 1/2 inch diameter indoor or outdoor curtain rod in 4 foot, 6 foot, 8 foot and 12 foot lengths. Available in two colors in stock, ready to ship. It can be used indoor or outdoor. Use on those windows that face patio or pool area, or use inside on any window. Charleston collection by Design Elements. This bamboo 2" curtain rod bracket is for mounting outside the window opening. The bamboo curtain rod rest in the holder. 6" x 1 1/2" with a 3 1/2" projection. Metropolitan modern curtain rod finial. Use with tab top curtains, eyelet curtains or pinch pleat draperies. 1 3/8" ID x 2 1/8" OD. Can be curved for bow window curtain rods. Only order in 20 feet increments. For grommeted curtains and hand drawn draperies in rental, office or commercial installations. Can be cut for shipping UPS if under 96". Select sizes below, or none. At checkout, select UPS cut track for shipping. Use Kirsch architrac series 9600 for pinch pleats and cubicle drapery applications and hospital curtain track needs. To avoid truck shipping when having track cut, choose UPS for Cut Track in the Shipping Methods at check out. Maximum cut must be less than 105 inches.